En suite in Master bedroom. £100 Breakages & Damages bond is added to all prices, this is returned within 7 days of leaving and a satisfactory inspection. 2019 dates are now being made and can be paid for in instalments. Rockley Park is renowned as one of the top holiday parks. Perfectly positioned in Poole, easy access to Bournemouth, Sandbanks & the Jurassic coast, why not take a trip to Brownsea Island or also nearby, Corfe Castle. On the doorstep you will find a fantastic sandy beach, with restaurant/cafe, also water sports are available here for booking separately. There are many scenic walks within the area. SEA VIEWS FROM OUR PITCH! Book 'Woodies' holiday home direct and know exactly where abouts on site you will be. 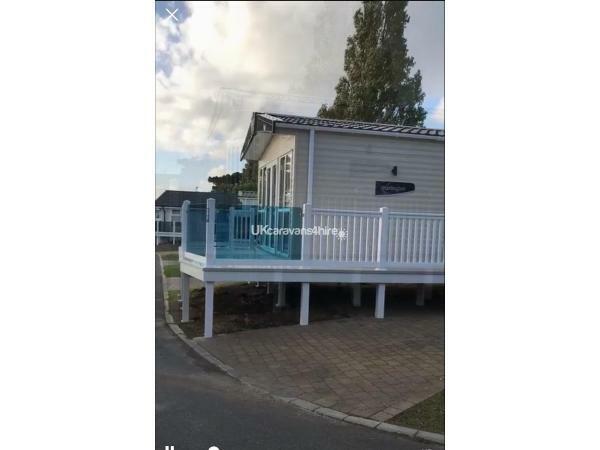 Our brand new FANTASTIC Top grade 2 bedroom REGAL HARLINGTON holiday home is of a new design, it is sited in a deluxe cul de sac on the fabulous Harbour View area of Rockley Park where we have stunning views of the sea. There is plenty of living space for 4 people. 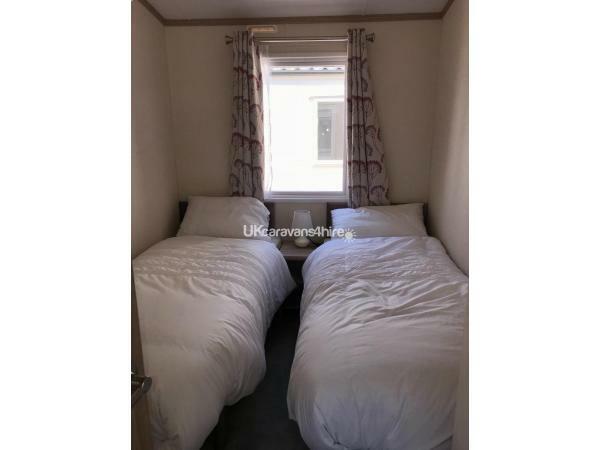 The main double bedroom has a KING SIZE bed with a regular bed depth mattress, rather than a caravan bed as well as a dressing table and wardrobe. There is also a flat screen TV & large en suite shower room, Free standing bedside lighting along with sockets and bedside cabinets either side. The 2nd bedroom has free standing twin beds. There is a double wardrobe with drawers & also USB charging points. The best aspect of our Holiday Home is that iit now has a glass fronted balcony for uninterrupted sea views across the bay. The kitchen has built in appliances, including a full size gas oven and top grill, fridge/freezer, microwave and also a full size dishwasher. There is a dining table and 4 chairs. All drawers & cupboards are soft closing. All cutlery, saucepans and crockery are all supplied. The lounge has 2 overstuffed comfy sofas and also a large storage foot stall. One sofa can convert into a sofa bed. There is a flame effect electric fire, 40" flat screen TV and DVD player. There is also a Bluetooth player included. Both bathrooms have a walk in shower, toilet, basin, radiator and ample storage. There is gas central heating and double glazing throughout, this is thermostatically controlled in the lounge area. We have a south facing veranda, along with a large wrap around open viewing decking area. Our pitch is situated in a sun trap area that is away from the main complex. It is a short walk to the beach. We have a selection of board games and books for your use. There is a smoke alarm & CO2 monitor installed. Gas & electricity are included in the price. PAT tested yearly. The van is no smoking and no pets are allowed. At present, we do not provide bed linen, so please bring your own sheets, pillow cases, tea towels and towels. We are happy to arrange the hire of bed linen and make up the beds for your arrival for a nominal charge. Booking requirements: A non refundable deposit of £100 is required within 3 days of booking to secure your dates. Full payment is requested 8 weeks prior to your holiday start date please. We also require a £100 damages and breakages deposit. This will be returned to you within 7 days once the caravan has been checked. Haven also request a £5 key release; this is returned to guests when the key is returned at the end of your stay. Amongst the many activities available on site for all age groups are: heated indoor and outdoor pools, all weather multi sports court, bowling green, archery, climbing wall, crazy golf, bungee trampolines, tennis, fencing, kids clubs. There is a full daily entertainment programme, with top live acts in its spacious club lounge, this also has a full bar. Please note: Entertainment passes are not included; these may be purchased at Rockley Park main reception. There is a bus service from the site to take you into the main town of Poole where connections can be made to Swanage, Weymouth, etc. There are many events on Poole Quay throughout the year. Out of season, Woodies is in a great location to be used for visiting family, friends and local areas, including several National Trusts sites as well as Peppa Pig World, Dorset Tank Museum and Monkey World all within a reasonable car journey. You won’t be disappointed with so much to see and do. Come and see for yourselves. 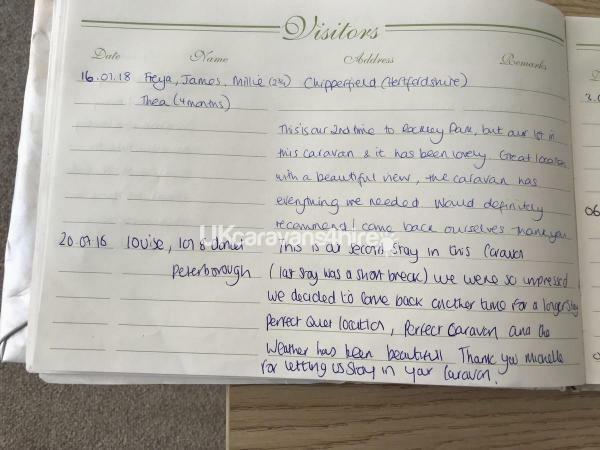 We hope you enjoy your stay, please feel free to write your comments in our guest book, along with the many others we are very proud to have received from people that have enjoyed an excellent time at Woodies Rockley Park, and we are pleased to say that we have returning guests, thank you. Additional Info: Heated indoor and outdoor swimming pool, all weather multi sports court, climbing wall, sun deck area. Spa (fee paying), new fish and chip shop. Regular bus service. (Summer time there is a ‘land train’). We have stayed here 2 times before and I have just booked this years stay also. The caravan is amazing and very clean with a lovely view. It is spacious but very homely with a lot of storage space. Michelle is very helpful and responds quickly too enquires. I can definitely see our family making more memories in this beauiful caravan at Rockley Park. We are already looking forward to our year visit to Woodies. Thank you for returning to Woodies Tanya Pleased to hear you had another great holiday with us. 2rd time at Michelle carvan and we absolutely loved everything about it . It has all you need for a lovely holiday break away with absolutely gorgeous views and very comfy clean and definitely 10 out of 10 stars for everything We will be definitely coming back and would 100% Recommend. Thank you Maria glad you had a lovely 2nd stay at Woodies you are welcome back anytime. We have stayed at Rockley Park many times but this was our first stay in this caravan...... and we weren't disappointed. The caravan is located in a quiet part of the park, away from the main complex but still close enough for little legs to walk to. Looking out from the lounge and outside area, you have a beautiful view across the sea. We were extremely lucky with the weather during our stay so we didn't stay inside the caravan much during the day but at night, it was perfectly comfortable and provided everything we needed. I wouldn't hesitate to recommend this caravan to anyone and we would love to stay here again. Thank you Tasha so pleased you had a great time. We would love to welcome you back to our new van soon. This was our secind time staying at Woodies & it was just as wonderful this time. Home from home accomodation with everything you could need. Amazing sea views which are lovely when sitting on veranda. Great location on park. Michelle makes booking effortless & is always quick to respond to any questions that i had. 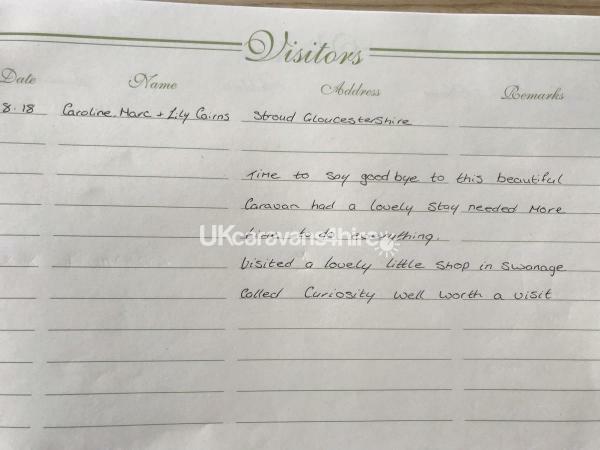 Thank you Claire pleased you had a great time do book again in our new holiday home. Thank you for an amazing review Maria, we look forward to you and your lovely family staying in our brand new holiday home later on. What a great review. Thank you Louise, we look forward to welcoming you to our new holiday home soon. Third year we have returned to Woodies and my only complaint was that we simply didn’t stay for long enough this time . The caravan is always immaculate and we love the location . Michelle really cares about her guests and even left a gift for my two daughters . We will definitely be back as always ???? Thank you for your lovely comments Erica. Hope to welcome you again soon in our new holiday home. We had a wonderful Time at Rockley Park, and the weather was perfect. Michelle and Paul (the owners) are a lovely couple and nothing is to much trouble, they are so helpful and friendly. Harbour View is a beautiful place to spend your holiday, near to the beach, and it is very quiet and peaceful. The Van is Very clean and very Cosy and everything there that you need. We really chilled and enjoyed every minute there. Thank You So Much. Thank you Bernie & Alan so please you enjoyed your stay. Ideal guests! Welcome back any time. Thank you Christina pleased to here you had such a lovely time! Please tell the girls that you are welcome back any tome! 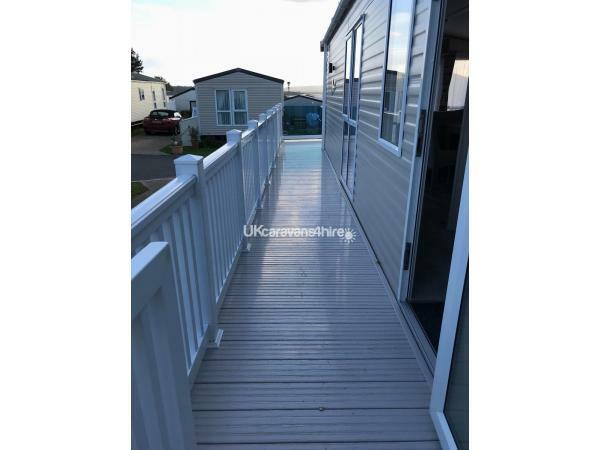 We love it at Woodies, it is comfortable and homely, this is our second visit to this particular caravan. We have had another great holiday. Thanks for your great review. Looking forward to welcoming you another time. One of the best caravans we have stayed in. Clean, tidy and spacious. The master bedroom is very roomy, even has a walk in cupboard! With plenty of storage throughout. The kitchen has a large free standing fridge freezer which was great for us. And the way it is separated from the lounge is a bonus. I can’t praise the friendly owner enough. Great spot, great views. I would highly recommend this to anyone!! Thanks for the great review Mark! Thanks for leaving it so spotless! Please book again anytime. What a lovely caravan! Very comfortable and cosy despite the rain outside! 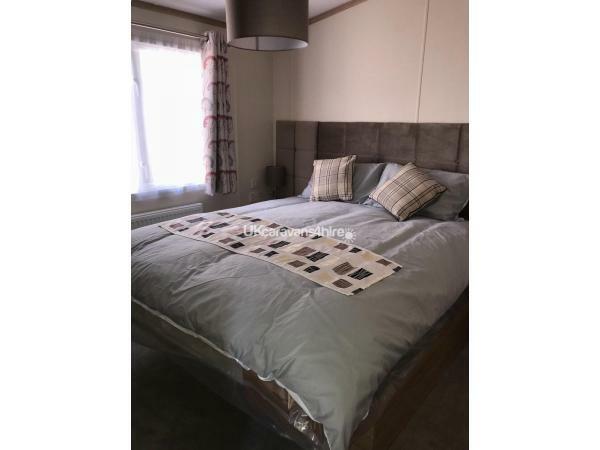 Master bedroom was fantastic size, a rare find in a caravan. Caravan was Very well kept with all modern facilities. Even managed a brief sit out on the verandah when the sun came out. Would recommend. Thank you Natalie, pleased to here you had a lovely stay at Woodies. Please do return! Beautiful caravan in a lovely location. Very welcoming and comfortable. Even our children felt at home. Thank you michelle. A wonderful holiday. Beds were lovely and comfortable, ensuite dressingroom and private toilet and basin. In the second bedroom it was possible to put two beds together.The lounge was clean, smart and comfortable .The kitchen was lovely and contained everything you could wish for (Just like home) For a day out we suggest Portsmouth. We saw the New Navel boat Queen Elizabeth2, the Mary Rose ,HMSWarrier and went up the Spinnaker tower' A lovely holiday was had by all. The only down side was that it all went to quickly, but there will be other times I hope. Really pleased to hear you had such a great time at Woodies. We look forward to welcoming you another time. We had a great stay at this wonderful holiday home, perfect location as we could enjoy the quieter area but close enough to walk to the complex with our two children. Would definitely recommend. Many thanks for your lovely review, you are welcome back any time. Beautiful caravan in a quiet area of the Park, a short walk down to Rockley beach and up the other way up to the main complex. We slept really well in the comfy bed and felt quite at home in the caravan. Thank you for a lovely week. Thank you for your lovely review. Really pleased to hear you had a great time and slept so well so important when you are on holiday! Please feel free to book with us again. We enjoyed our 5 day break at 'Woodies' very much. 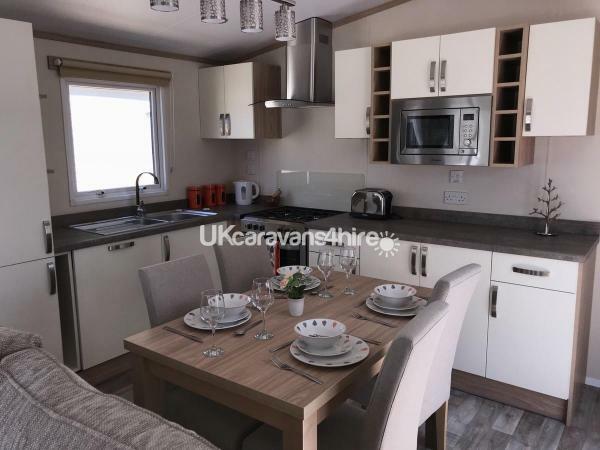 We were very impressed with the layout of the caravan, especially separate lounge and kitchen diner. The caravan was extremely clean and tidy on arrival, Michelle has chosen some nice pictures and ornaments which make the overall appearance very homely. We mustn't forget the views,which are lovely. Rockley Park is great for sightseeing. There are plenty of super places to visit. We didn't waste any time.Overall a great week! !...Many thanks Michelle. Thank you Paula. Plovelybto read. Please come back another time! Having never visited Poole before my daughter recommended Rockley Park. From the start to the end of the holiday never where we disappointed. Michelle,s holiday home was lovely and modern fantastic location weather was superb so could sit out on the decking and enjoy the view. Thanks Michelle and Paul. We had a great week here. The caravan is clean and comfortable. The area of the park in which it is located is quiet and ideal for young kids. There is a wonderful view of the water from the front and a grassy area out the back; perfect for curious toddlers to play around. The site as a whole is well kept and very much geared towards families with younger children or those looking for a quiet and relaxing holiday. If the weather holds out - as it did when we were there - there's not much more you could ask for. Thank you for your lovely review Paul, thank you for leaving our holiday home so lean and tidy. Please feel free to book again. Beautiful holiday home. Set in a peaceful part of the holiday park. The views were lovely, and only a short walk to the beach. Thank you for your review. Please book again with us! Beautiful caravan. All home comforts in a stunning & peaceful location. Highly recommend & will definitely use again if visiting Dorset again. Thank you Claire pleased you enjoyed your stay. We look forward to welcoming you again! 2nd time staying in this caravan..we simply love it..its so homely.and well appointed..modern and a real home from home. Michelle is great to communicate with. We love this area of the park as its handy for the beach and also turned out to be handy for getting an amazing view of the incredible thunder storm we had one night ! The fact weve returned for a 2nd year is testament to how fab this caravan is..we will be back again ? Welcome back Erica. Great to hear you had such a lovely stay again at Woodies. We look forward to hearing from you again soon, you will always be welcome. Lovely Caravan, great modern feel, nice outside space. 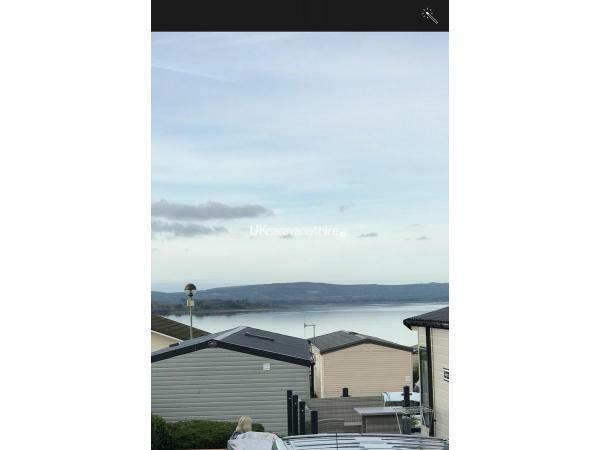 Harbour View is a great part of the site, the value for money score was lower due to having hired 3 caravans all on harbour view (one on front row with 3bedrooms) and it was most expensive of the three and also the smallest. None the less it was a nice caravan. It was definitely the best van though Rob! The lounge is closed off from the kitchen which may be why you felt the van was smaller when it is actually 39 feet long, the same as many Platinum grade vans. Thank you for your comments Susie. So pleased you found it in first class condition again. You are welcome back any time. My wife and I had a lovely time, a wonderful stay. From the moment we walked into the caravan it felt warm, cosy and inviting. The caravan was immaculately clean with lots of homely personal touches that made our break feel very special. It has parking right outside which was handy for unloading our cases etc. The caravan also has a large veranda allowing us to take in the beautiful view over the surrounding coast whilst enjoying a glass of wine. Without doubt the best holiday home we've stayed in. Thank you so much for your lovely comments, please come back another time. Lovely caravan and great value for money. My partner and our 2 year old son stayed for a long weekend and the moment we arrived we both commented on how the caravan looked from the outside with the nice private parking/drive and the very spacious verandah. The caravan inside was very clean and had everything we needed. There isn't anything we could fault with the location and we happened to have a great weekend of weather. Being able to lock the verandah gate enabled our son to run around and for us to feel comfortable without having to continuously watch him as we could hear him and see him through the many windows. The King size mattress and bedroom TV again was perfect. Will definitely be returning as Michelle was amazing to communicate with regarding any queries we had before booking and very quick to return the deposit. Fantastic to hear you had such a great time. You are welcome back anytime. So pleased you found everything to your satisfaction. We had a fantastic holiday at Harbour view Rockley park!! We would highly recommend it to all as there is something to do for everyone. Please don't hesitate to book as you'll have a great time!! Many thanks for your lovely comments, please come back anytime! 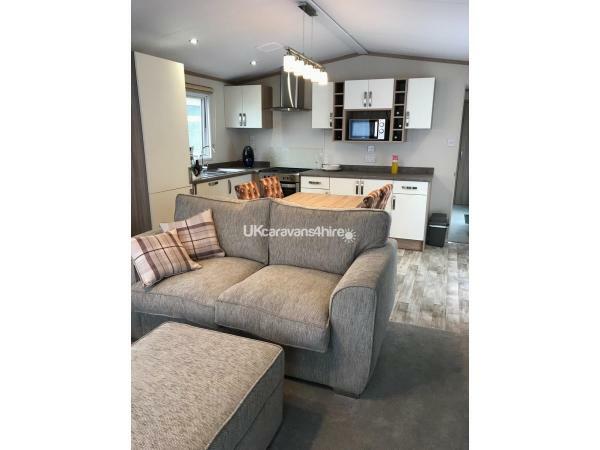 Had a very good week at this caravan, very good location lots to do on site, lots of hot spots to chill and read.Spacious caravan very clean and comfy, will go back again Thanks Michelle. Thank you for your comments we are glad you enjoyed your stay and we welcome you back another time. We had a brilliant holiday and wish we could have stayed longer. We loved the caravan, so clean, cosy and homely and we loved sitting on the verandah looking at the sea views and agree this is lovely for young children to play on too. The setting was perfect in a secluded cul-de-sac and near to the beach which was great for the crabbing!! The king size bed was so comfortable too. Michelle was lovely to deal with and we would definately recommend this caravan but not to too many....we want this as our secret find!! Thanks Michelle and Paul for allowing us to stay. Thank you so much for your feedback. We are really pleased that you had such a good time. You are welcome back anytime. We have just returned from a weeks stay at this caravan in Rockley Park..it's our second visit to Rockley but first time staying in this van. The location is perfect..we woke up to a view of the sea every day and the van itself was immaculate.Beautifully laid out and had everything we needed.It is modern and to a high specification and felt like a home from home. We all enjoyed our stay there and will definitely be going back again. Had a very nice stay at Harbour View, location was great. The rap around veranda is also very handy if you have small children. Caravan is very clean and tastefully decorated with a well stocked kitchen area. Bedroom areas were very comfortable. Will holiday there again I'm sure. Thank you for your comments, I'm so pleased you enjoyed it. You are welcome back any time. This was our second stay at Woodies..We stayed last Easter weekend and was lucky enough to stay again this year. Communication with Michelle is always great. The caravan is like a home from home with all mod cons that you need. The views are stunning and we would definitely recommend this caravan and hopefully will be back again later in the year. Thank you, so pleased you had a lovely time at Woodies. We welcome you back any time! Thank you for your comments. We are thrilled you enjoyed your stay and that you found us so helpful, please come back again! Thank you, we like to make your holiday a loveY stay for you. Please come back again! Beautiful holiday home, very clean and modern with everything you need. We had fantastic weather to be able to sit on the veranda with the stunning views. The king size bed was extremely comfortable. Michelle was a real pleasure to deal with. Would highly recommend this holiday home. Thank you so much Michelle and Paul for letting us stay. We really didn't want to go home. Thank you for your comments, it was a pleasure having you stay at Woodies. Please come back again! This was our fourth year running at Rockley Park and we have stayed on pine grove and pine ridge previously, so we wanted a caravan with a sea view again. This caravan did not disappoint and it was lovely sitting on the verandah (in between the showers!!) looking out to sea. The accommodation was modern and fresh with everything we needed. Thanks for letting us stay Michelle! Thank you for your comments, sorry about the weather! Glad you liked the stunning views though! We have been to Rockley many times and stayed in lots of caravans over the years. This new caravan is lovely, modern, clean and well designed. It had all you need for a comfortable stay. The location is lovely and quiet (with the exception of one mad couple trying to jump the fence at 1:30am on Saturday night!!! lol)with spectacular views. We would definitely recommend and stay here again...thanks Michelle.. Thank you for your feed back. Very pleased you enjoyed your stay. The pool is beyond our control but I'm pleased you enjoyed our spacious holiday home. You are welcome back any time. Currently staying in this magnificent caravan, having living in a caravan in 1989 for six months, whilst building our own home, we have only had two holidays in caravans before. One was in Skegness, a draughty old thing and a lovely caravan at Haggerstone castle. None of them compares to this one. We used to open the oven door for heating in the Skegness caravan. It\'s the end of October now and we have had drinks on the outside deck today. 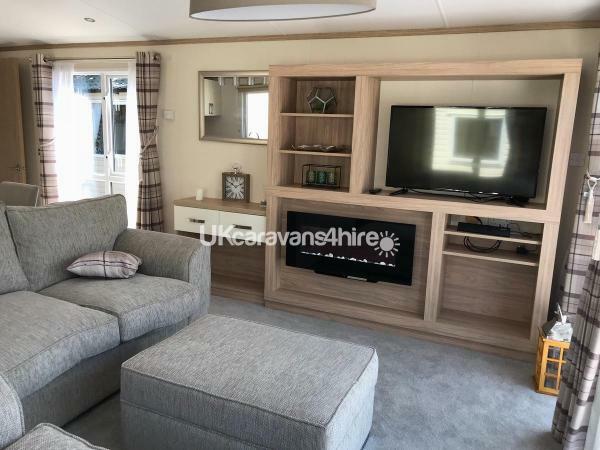 Everything about this caravan is truly amazing, we have a fantastic Bungalow back in Yorkshire, but we could happily retire here, especially on this site and in this fantastic well designed and warm caravan. As all the other reviews mention, there are endless places to go. Not looking forward to going home, but at least we know this fantastic caravan will still be here to rent, we will be back!! Thank you so much for your review. You are welcome back any time. You are very welcome, hope to see you again! Thank you also for looking after our holiday home so nicely. You are welcome back any time. Lovely caravan we have really enjoyed our stay here. Everything here we needed and Michelle you are very friendly and helpful. A week of great weather, great days out including the air shoe, Paultons Park with Peppa Pig! Thanks again!! Will be back! Thank you, glad you had a great time! Review:	"Beautiful holiday home, lovely and peaceful setting. Were made very welcome by the owners Paul & Michelle on arrival, we will return soon. Highly recommended, thank you. " Thank you, you are welcome back any time!